So, the last few days were not exactly what we had planned … but we’re home now and Emily is doing great -back to her normal, spunky self. I’ll give a brief recap, just in case you’re lost as to what happened – perhaps because you haven’t read all the posts, have read the posts but didn’t understand them, read the posts and got completely confused with all the changing information, were taken by complete surprise because you didn’t even know she was having her port removed (sorry Gaby! ), or you’re like me and you wait until you have all the information before you pay attention(!). Thursday morning Emily and I checked in at the UC Davis Children’s Surgery Center one last time so she could have her port removed. Now that she’s completed her treatment, and she’ll only need one lab draw a month (and possibly one IVIG transfusion a month), it’s best to take the port out to reduce the risk of an infection. 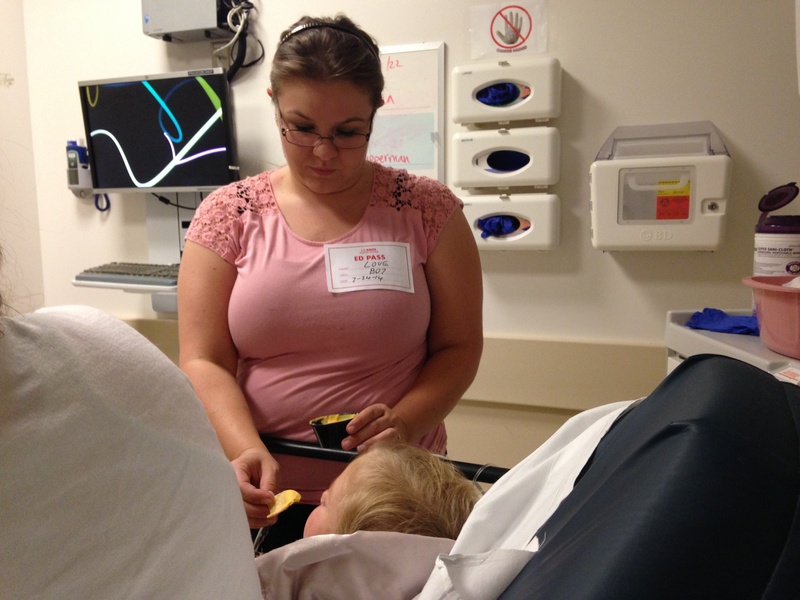 We passed the time visiting with all our beloved doctors and nurses while Emily colored on her sheets. We haven’t been to the surgery center since April, and we don’t expect to go back, so it was fun to see everyone and say goodbye. Heading to the Op Room! Dr. Abramson, the surgeon who initially placed her Broviac 2 1/2 years ago, performed the surgery to remove the port. All went well, and she was back in Recovery in just one hour. 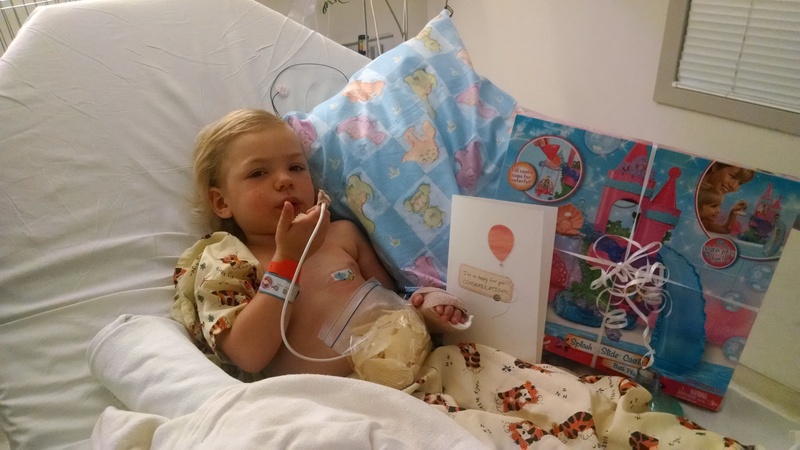 Her nurses gave her a special card and gift. 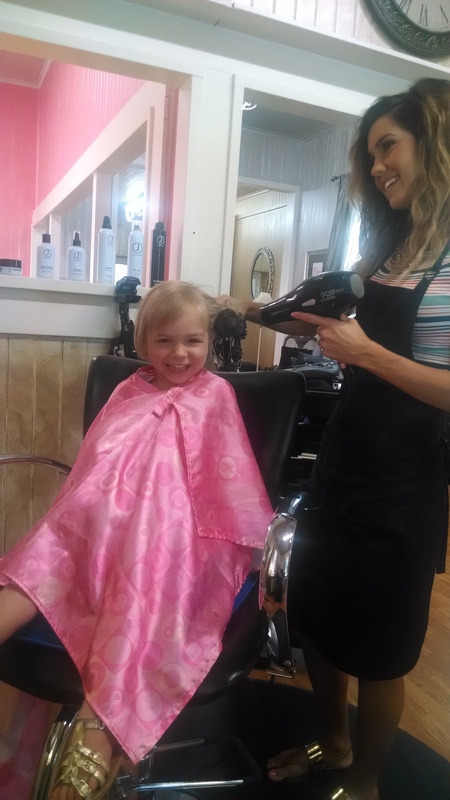 She doesn’t look excited here, but she really loved it. Once she had eaten and had a little drink, we said our final tearful goodbyes and headed out. She couldn’t quite walk on her own, and my arms were full, so she got to be pushed out in one of the new carts (donated by our amazing friend, Kimberly Kaufman at Angels for Hearts). 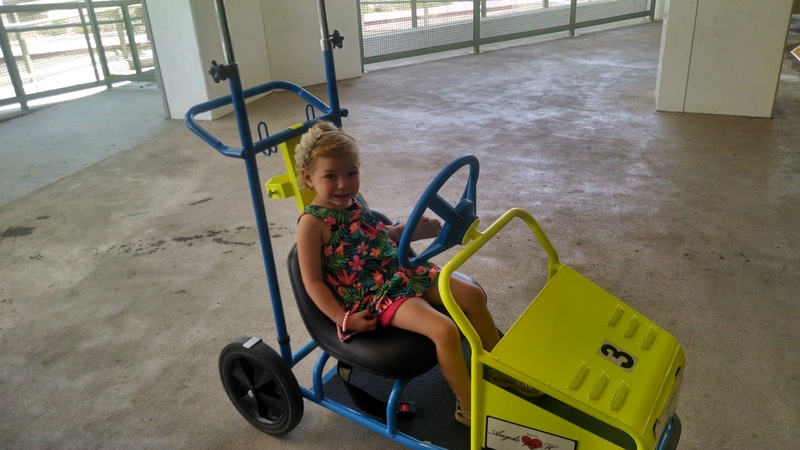 We headed straight to the Cancer Center for her monthly IVIG infusion. Our hope is that this was the last one. Now that she’s off treatment, it’s very likely that her body will begin to produce the missing antibodies on its own again, and she will no longer need this extra immunity boost. She’d had a peripheral line placed in her hand while she was under anesthesia, and she was very careful not to knock or jostle her hand. She just kind of held it out the whole time. 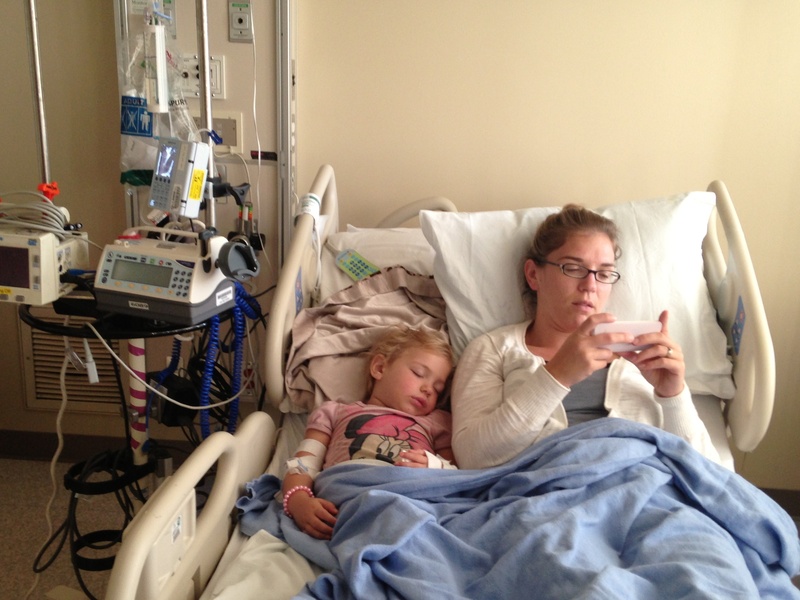 Her transfusion took about 1 1/2 hours, and she was quiet and restful the whole time. 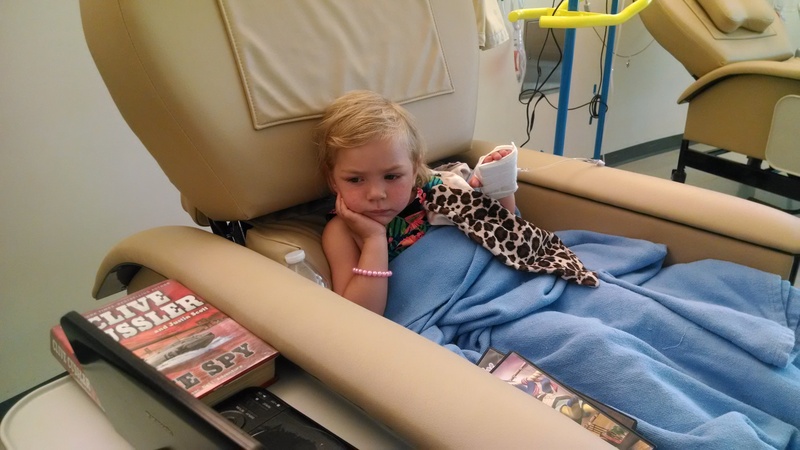 She seemed to still be groggy from the anesthesia, so she watched a few movies and relaxed. Just as her transfusion finished, only 5 grams of the antibodies, and the nurse was setting up her flush (saline to push the Ig all the way in and to clear the line), she started slouching down in her chair. Then all of a sudden she began shaking and crying out that she was cold. Thinking it was simply cold in the room, I sat in the chair and cuddled her in my lap. But her shaking became more and more violent -so much so that she folded herself into a fetal position and cried out that her back HURT! She kept saying, “I’m cold! I can’t do this!” And then I realized she was burning with fever. Her nurses responded instantly. They hooked her up to watch her vitals – her heart rate shot into the 170s, her blood pressure plummeted to 80/50, and her temp measured at 39.5, or 103.1 -they called in the oncologist team, and they pushed in a bolus of fluid (a fast running, large amount of saline to bring the blood pressure up). At first everyone thought it might be an allergic reaction, but then one of her docs said, “We’ve seen this before,” and they started sepsis protocol (a typical IVIG reaction might not occur for three days). When the bolus didn’t help, they called 911. Within maybe five minutes of the initial symptoms, the paramedics were at our chair. The nurses all worked together to put in a new peripheral line so they could draw blood to culture -to grow and see if she had an infection. Then we were wheeled onto the ambulance and driven (all the way) across the street to the ER. 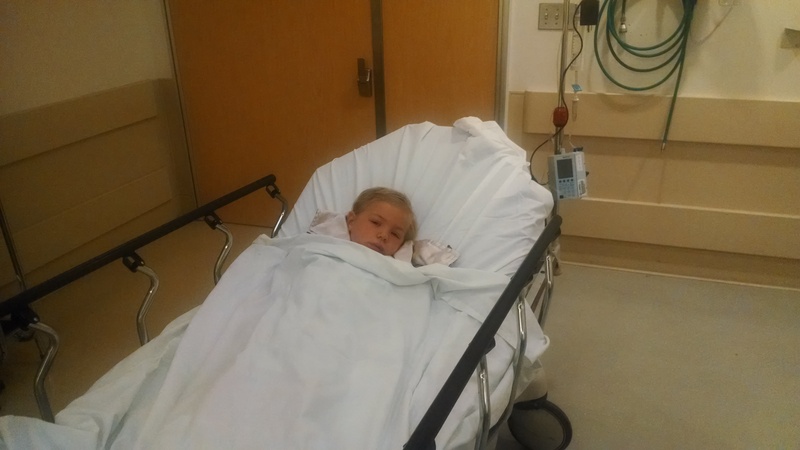 Once there she was given antibiotics, Tylenol to bring the fever down, and two more boluses were pushed within one hour. Thankfully this all had the effect they were hoping for. Her blood pressure came back into the normal range and her fever subsided -for the most part; we had to help the fever a bit with cold cloths, but it eventually came back down. She also had a chest xray and nasal swab. They wanted to check for any possible infection. She was really tired and fell asleep quickly. There is no cell reception in the ER, so I sent out an SOS email, and everyone scrambled to make arrangements. Jason had to stay home with Sophia, who had a little bug (not related to Emily), so my mom and Aunt Gaby came to sit with me. She was definitely being admitted, but they hadn’t decided yet if she should go to the general Peds floor or if she needed to go to ICU. Her heart rate was still really high, and they needed it to come down. 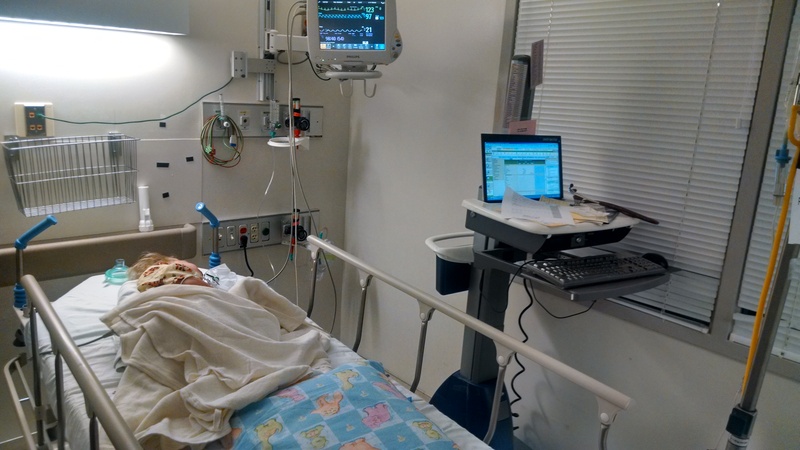 Around 11:00 pm, she had another episode of fever and chills with elevated heart rate, but this time Tylenol fixed everything quickly, and it was decided she didn’t need the extra care from ICU and could go to the general Peds floor. As we waited in the ER, and then as we got settled into our room on Davis 7, some of our nurses stopped by to say hi. Of course no one wanted to see us in that condition, but it was still good to see them again. Throughout the night Emily’s heart rate continued to drop back into the normal range again, and she didn’t have any more fevers or chills. By Friday morning she was already feeling better -tired and puny, but better. 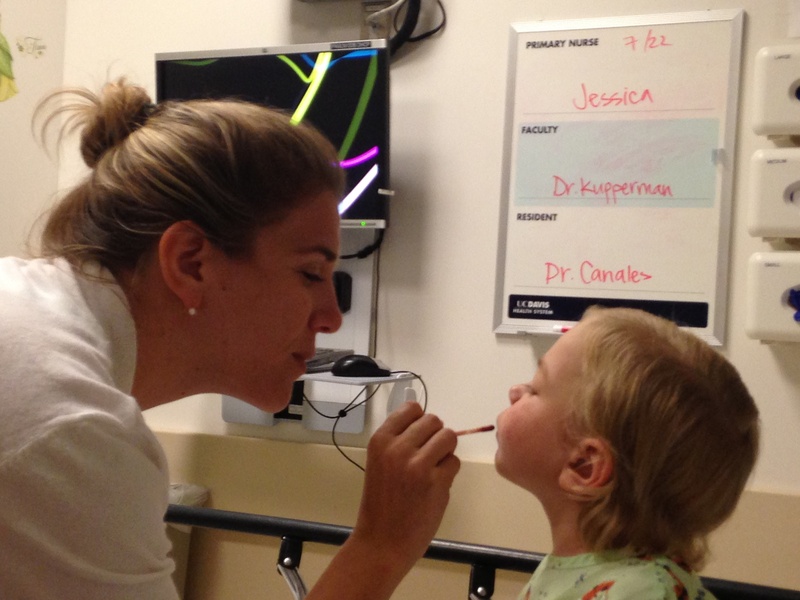 Her surgeons stopped in to check on her, then the Hem/Onc team came by to share their thoughts. That’s when we first heard about the spot on her lungs and the possibility that it might be a fungal infection. But after 24 hours (Friday evening) of negative blood cultures, and no more symptoms, the thoughts switched back to an allergic reaction. There really is no way to definitely know what the spot on her lungs is without invasive procedures, and those bring their own set of risks, including a greater risk of cancer development. So because the cultures remained negative (by Saturday night they were negative for 48 hours), she remained afebrile for at least 24 hours, all her vital signs returned to normal, and because the symptoms started right after receiving IVIG, which is allergenic, and she had had no signs of a fungal infection prior to Thursday (like a cough), her doctors were comfortable sending her home today. When we see Dr. Ducore in a couple weeks, we’ll discuss the possibility of doing another chest xray in a few months to check on that spot. Emily was thrilled to head home. She wore jewelry, pajamas, and gladiator sandals -on the wrong feet -and carried her baby in matching pj’s, and walked out on her own two feet. Is THIS the final answer?!!! Emily woke up this morning with the beach baby tousled hair! negative today, home may be a reality tonight! This is what happens when you leave Emily with Grammie for awhile – Ruffles – best nutrition ever! Emily’s Resident MD this morning said again that they think she had a reaction to the IV Ig infusion on Thursday, rather than sepsis, because if she had been septic, she probably wouldn’t have responded to treatment so quickly. When she’s been septic in the past, she’s been very sick for days. This time her symptoms improved within 24 hours and she never needed pressors to get her blood pressure back up. As for the odd finding in her lungs on her chest X-ray on Thursday, they’re not certain it is a current fungal infection, as it could be an artifact (or something left behind, like a scar when you get cut) from a past infection. For example, someone who has had pneumonia in the past will usually have some kind of finding on an X-ray that shows that they had a lung infection in the past. I’ve had pneumonia twice and it always shows up on an X-ray. 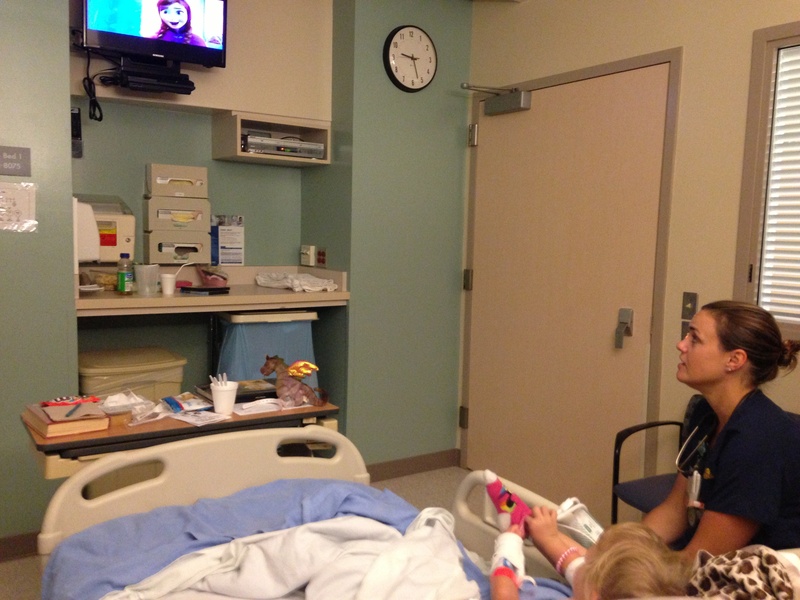 And here we have Emily and her nurse, Angela, singing along with Frozen! and this frustrating back-and-forth is how it goes daily. Unfortunately the doctors cannot see inside of her body and say THIS is what’s going on without doing something invasive like a biopsy or another test like a CT scan, both of which have their own set of risks. 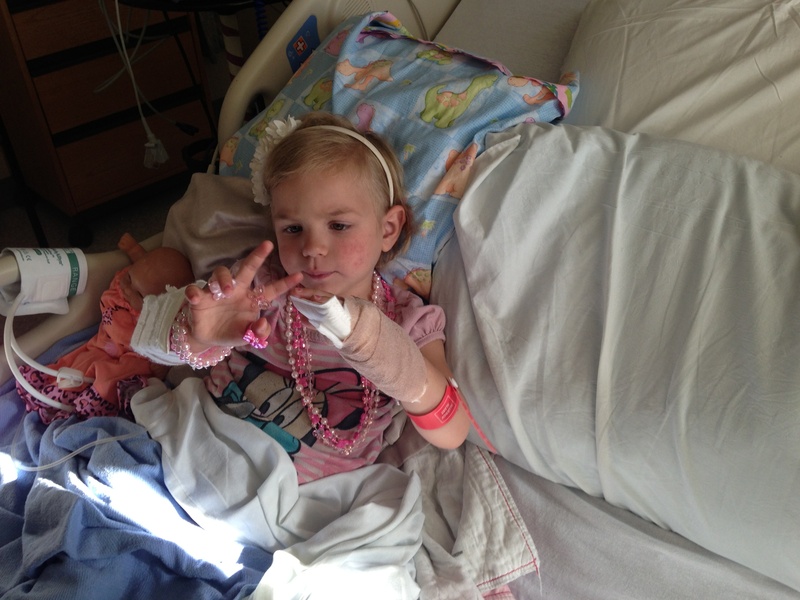 Right now, they can see a little girl who has responded well and very quickly to her treatments, and who has shown no other signs of current infection. So her Resident said that they will mostly likely send her home and then do a follow-up chest X-ray to check on the spot on her lungs in the near future. 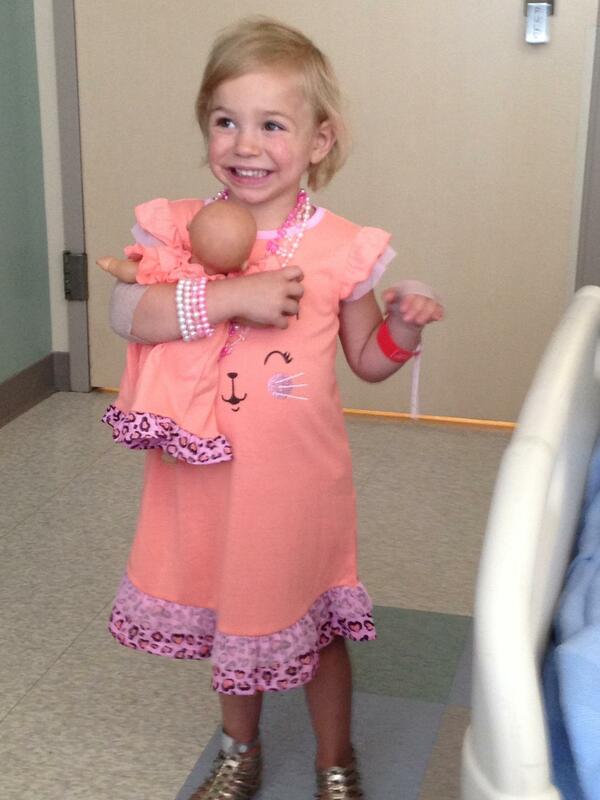 Princess Emily today – complete with jewelry and IV lines! God continues to show His kindness to Emily! He brought her a special nurse last night, Angela, who has two girls and totally gets Frozen! She even sat down and sang one of the songs along with Emily and the movie! Grammie got a chance to watch three(!) Super Why movies and an entire Frozen movie while Chrissie went home for several hours last night to spend time at home. Please, as you are already doing(! ), keep praying for Emily and Chrissie – and Emily’s doctors – and brothers and sister – and, of course, pray for Jason who has totally carried the home front organization during this hospital stay – from taking care of a very sick Sophie on Thursday to rearranging – very creatively, I might add – his schedule and life to take over while Chrissie is in the hospital with Emily. Quick update. One of Emily’s regular doctors just came In. 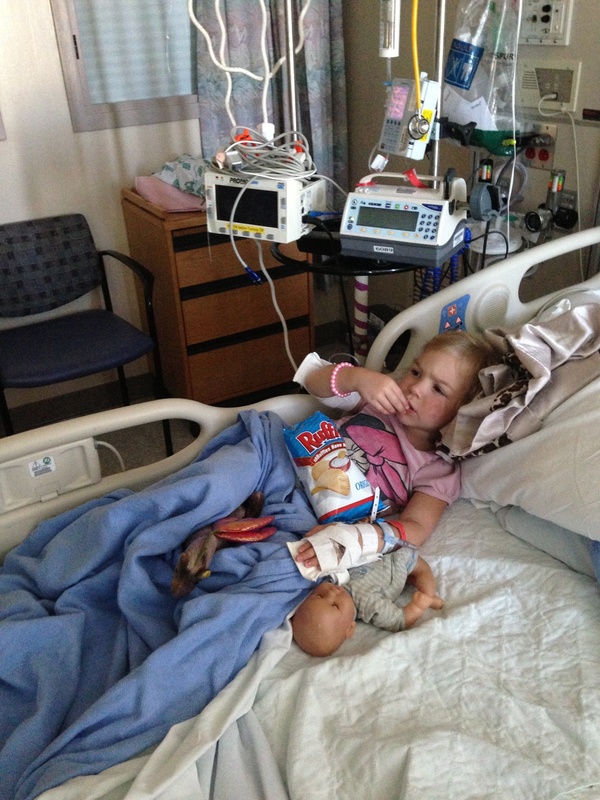 Instead of sepsis, they are thinking that she had a reaction to her IV Ig infusion yesterday. 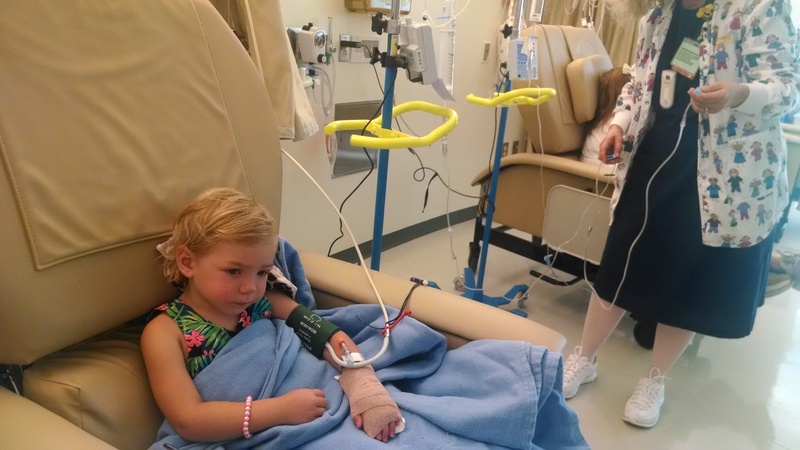 She’s had lots of these infusions – monthly for a year now – but sometimes reactions can just happen. As the doctor said, each IV Ig batch is a mix from thousands of donors so maybe there was something in this batch to which her body reacted. And a typical reaction to it is often increased temp and heart rate, etc., all the symptoms which she had yesterday. As for the lung X-ray, the doctor thinks that it’s evidence of a past inflammation rather than an ongoing fungal infection. He said that if she remains afebrile today and tonight, she could likely go home tomorrow. Chrissie and I were thinking about the time a year or so ago when Emily was hospitalized for a cough and ended up in the PICU because her oxygen levels were too low -and an X-ray that time showed spots on her lungs. As always, we may never get a clear answer but for now the good thing is that she is continuing to do well. Emily is doing much better right now. She got shaky cold and her temp want back up to 102 while still in the ER and her heart rate stayed in the 130’s for awhile but her temp is now normal and her blood pressure and heart rate are good this morning. 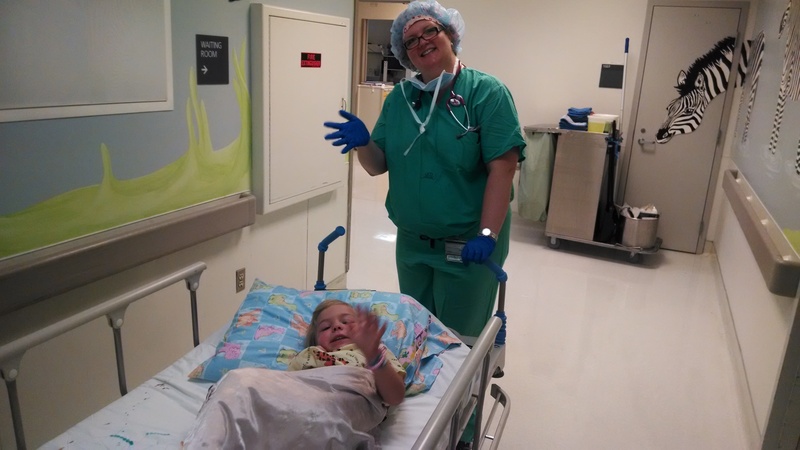 The hospital was swamped last night with both adults and kids on beds in the ER hallways at one point – ER nurses need special prayers – so it took awhile, and a couple of movies, before she was transferred but Emily was able to transfer up to a room on Davis 7, the Pediatric unit, at about 11:00 pm. The news we have this morning is that a chest X-ray which was done yesterday as part of the standard sepsis protocol showed a small little spot – a “nodular opacity” – in the right upper lobe of her lungs that the radiologist read as a possible fungal infection. A fungal infection would have probably been there for months but Emily wasn’t showing any symptoms and so no one suspected. 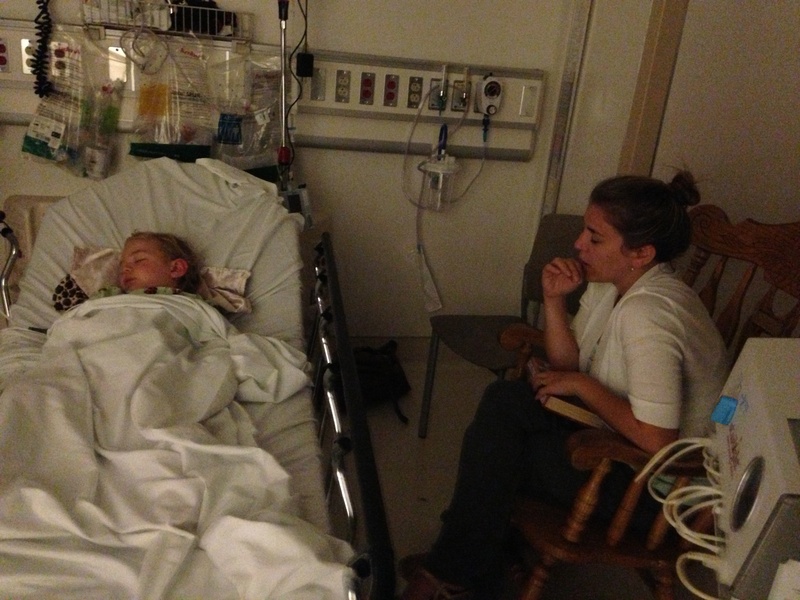 As we’ve learned along this road with Emily, she’s either well – or she’s very very sick. She has no in-between like normal people. We have no definite answers yet but as of now, it looks like there are two possible scenarios with one for-sure. The for-sure is that this fungal infection has probably been brewing for awhile. First scenario is that the stress of the surgery yesterday coupled with the brewing fungal infection overwhelmed her system and caused the sepsis. Second scenario is that the sepsis occurred for who knows whatever reason and the fungal infection was caught as a side effect. 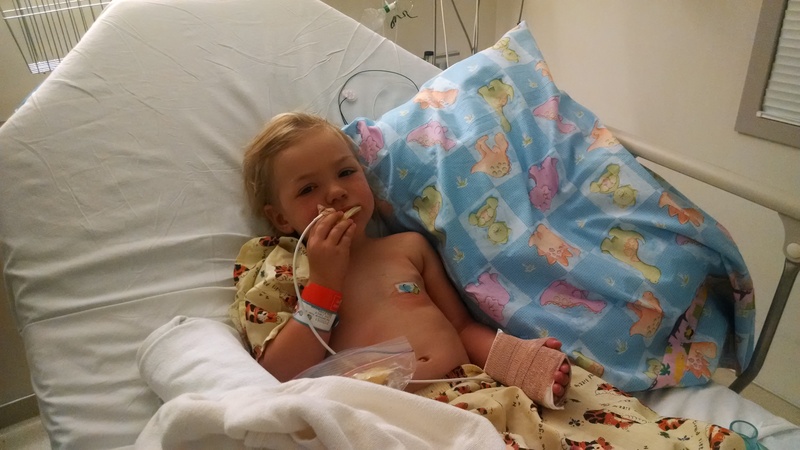 Either way, God is GOOD – because a lung fungal infection in an immunocompromised little girl can be very bad. Right now, Emily is on Rocephan, a broad spectrum antibiotic, and Fluconazole, an anti-fungal medication. The first doctor this morning said she may be here for 48 hours and then treated at home. 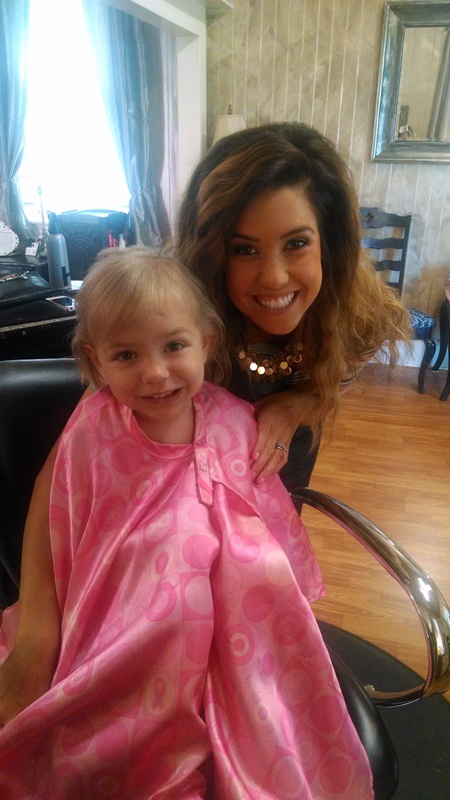 We got a surprise visit from Emily’s favorite primary nurse, Nicole! On another note, life is different now that Emily is “older” and in the hospital. 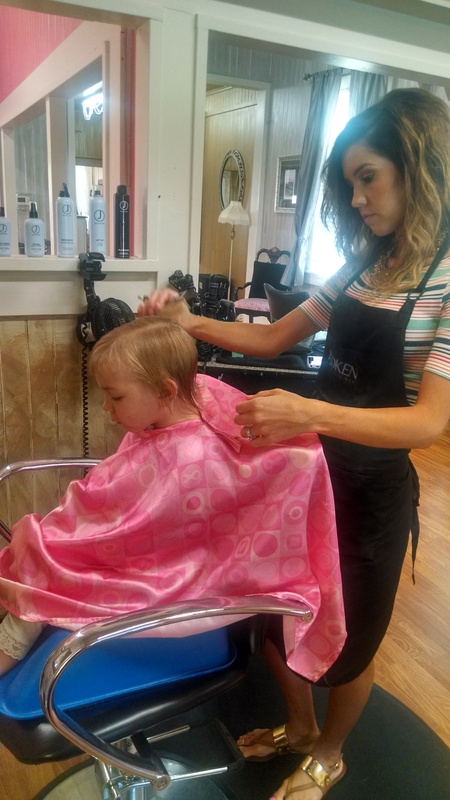 We’ve had a couple of really quick trips – and not always quick enough – to the bathroom now that she’s potty trained. Also, now that she no longer has her port, she has an IV lines in each arm and that makes it REALLY hard to get a clean nightgown on. I really am not sure why hospitals don’t have Peds gowns that snap?! Emily asked Chrissie for some lip gloss! So, if you were expecting, as we were, that the next blog would be about Emily’s end-of-chemo celebration party or about how her no-longer-permanent port was removed today, then Stitch has had a bump in the road that has thrown everyone for a loop. She is, as I type this, on a bed in the ER at U. C. Davis. This was Emily when I/Grammie first got to the ER. 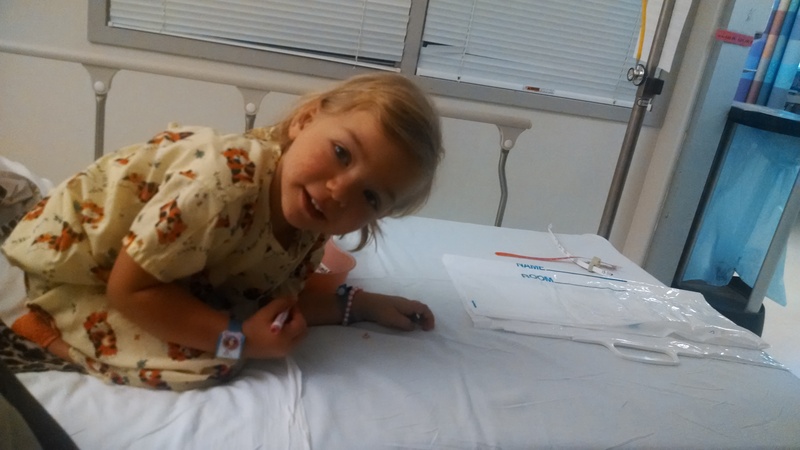 Emily went in this morning to have her port removed. Yea!!! 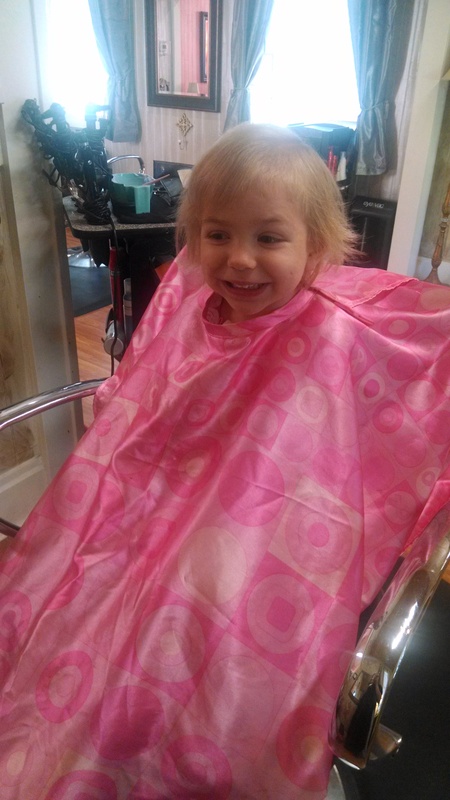 That went well – and then she went to the Infusion Room to get her monthly IV Ig infusion, which helps her immune system. All went well with that and then, as they were getting ready to flush the line and unhook her, she started to shake and say she was cold, her blood pressure shot down to 84/59, her heart rate was in the 170’s and her temp was 102.5. 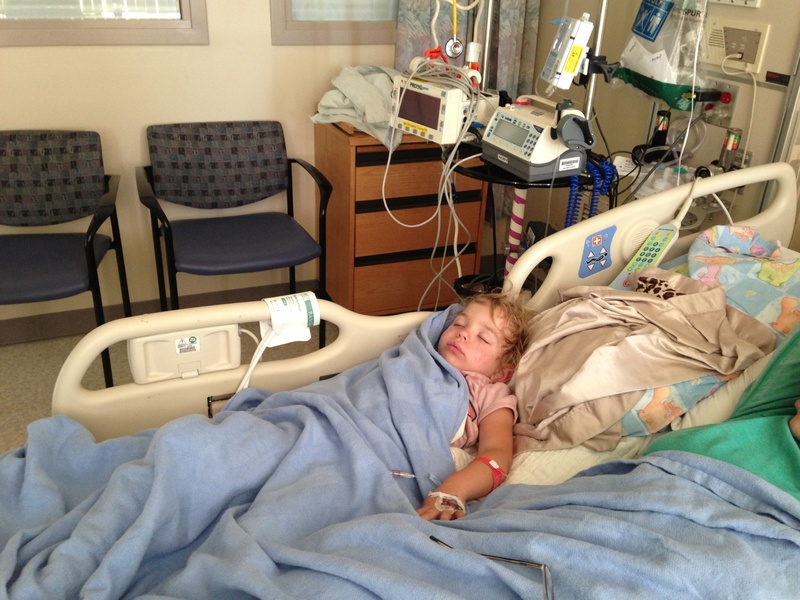 They thought it might possibly be a reaction to the IgG infusion but then a doctor came in and said no, we’ve seen this before – as in the couple of times before when she’d been septic. Sepsis is basically an infection that gets into your blood stream. It can overwhelm your body quickly and is a medical emergency. Emily and Chrissie were taken in an ambulance across the street to the ER. After a couple of boluses of IV fluids and starting an antibiotic, her temp and heart rate have come down and her blood pressure has gone up. The diagnosis is still uncertain but either a reaction or sepsis seem to still be the two choices. Mostly because her symptoms came on so suddenly. 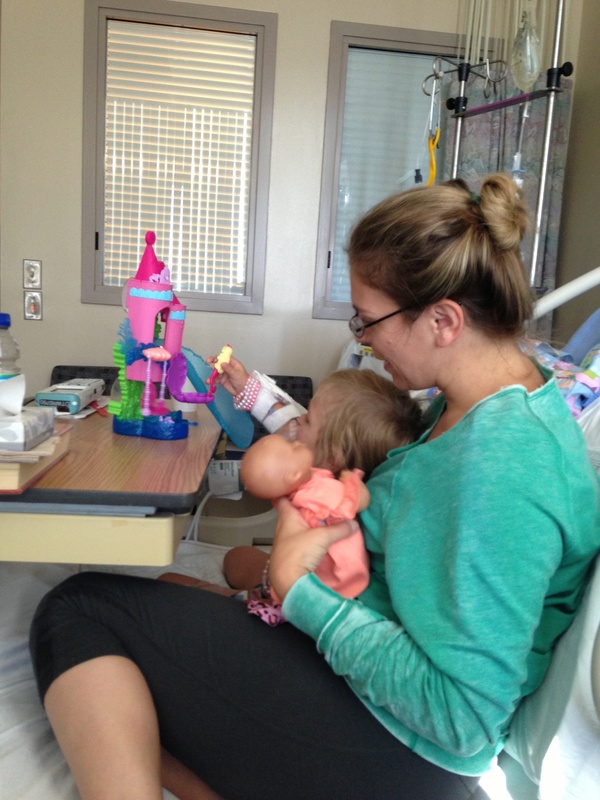 Gaby had to feed Emily her food because Emily has an iV board on each arm to keep her from bending them. 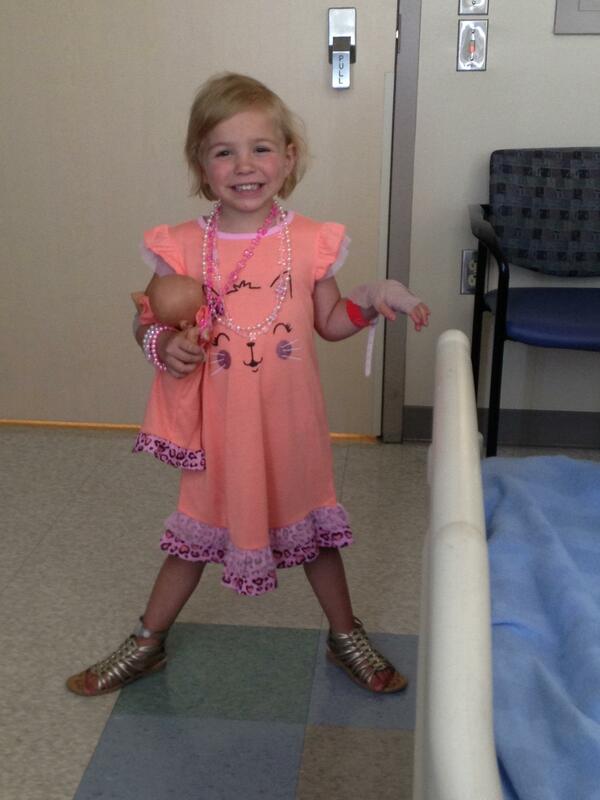 Now that her port I’d gone, she has to have iV sticks – but she’s a trooper. Auntie Gaby got here about 9:00 pm and brought food! Emily ate a little and Chrissie and Grammie ate more! Emily is sleepy. We are waiting to get admitted to the Peds floor but the hospital is busy tonight and we don’t know when that will happen. Will have to fill everyone in when we know more tomorrow. 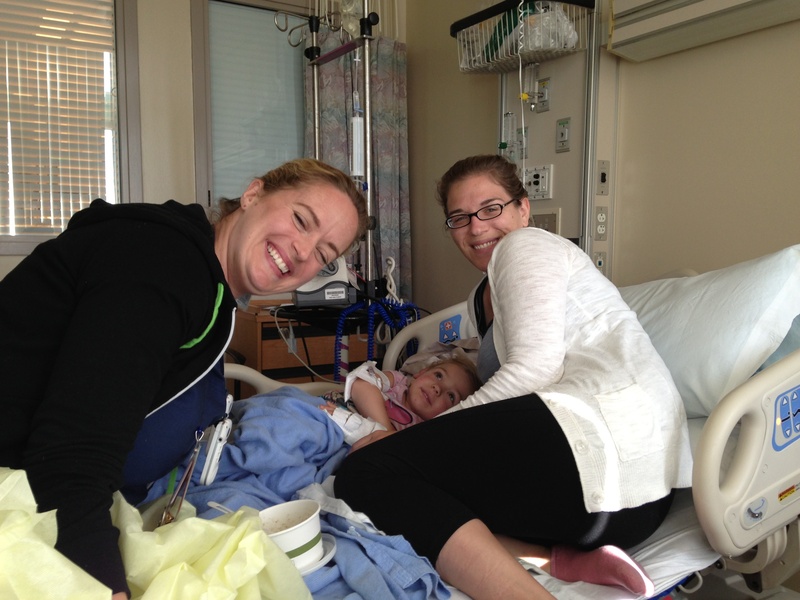 In the meantime, please – we didn’t think we’d have to be doing this again – pray for Emily and Chrissie. 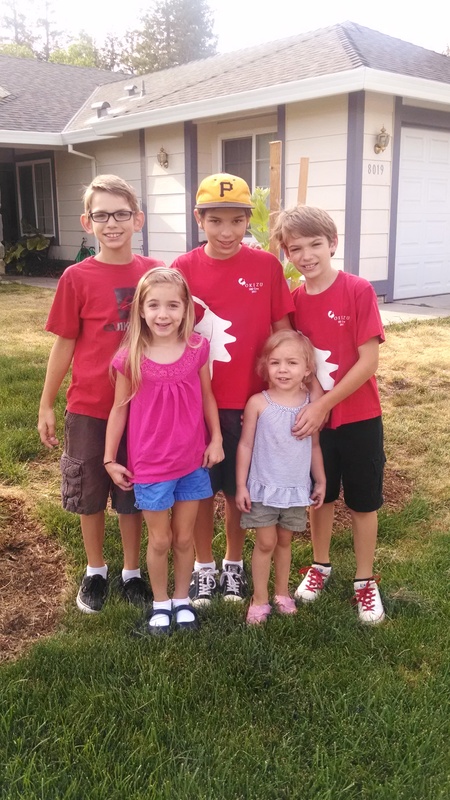 And pray for Jason, who is home with the other four kids, one of whom – Sophie – has been sick all day. (Emily wouldn’t have caught this from Sophie – Emily’s symptoms came on too suddenly.). Hi Everyone, if you got a notice from Facebook telling you the party was canceled, ignore it! The party is STILL ON! 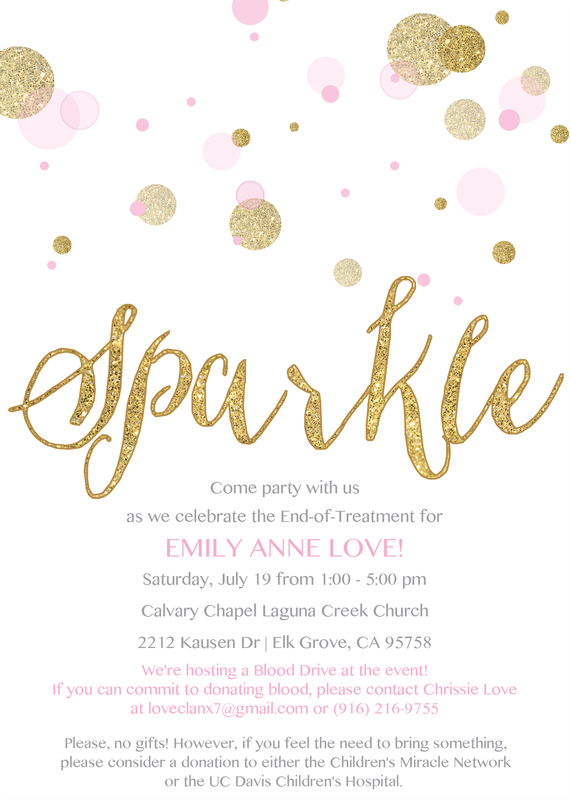 There was a glitch on FB, so please spread the word to anyone who asks: We are still celebrating on Saturday, July 19th, from 1:00-5:00 at Calvary Chapel Laguna Creek, 2212 Kausen Dr, Elk Grove, 95758. Unfortunately, the Blood Drive has been canceled. We were not able to make it work. However, we will still have a rep from the Blood Source there to give out information regarding blood donations. She will also be taking signups for the Bone Marrow Registry! The older four Love Children left for Camp Okizu yesterday. 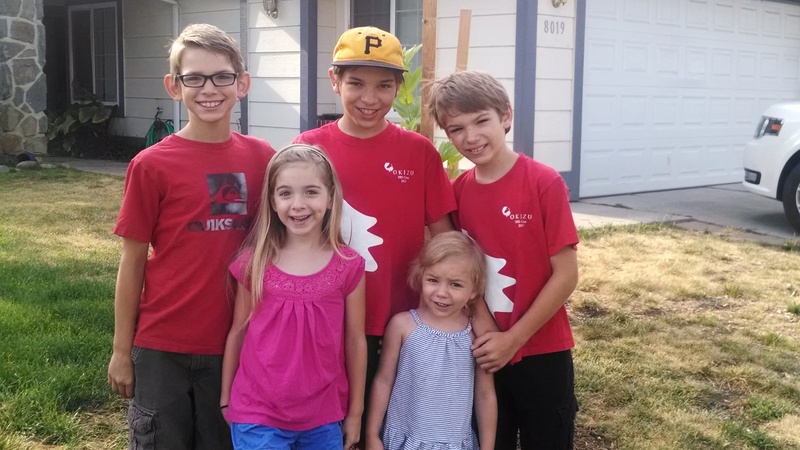 They’ll spend seven days at SIBS (Super Important Brothers & Sisters) Camp, where they’ll enjoy all the usual camp activities, sleeping under the stars, and having a great time with other siblings of cancer kids. The boys went last year, but this is Sophia’s first time going without us (!!!!) – I’ve already called the camp office to check on her. She’s fine. We are so blessed to have this wonderful adventure to participate in! But we cannot wait until they get back! It’s not quiet here with just Emily … but it is weird not having everyone else.